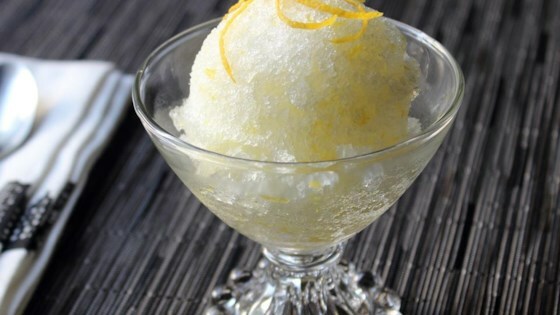 "Using the classic Italian granita technique makes this an easy and refreshing summer treat. I love the contrast between that light texture and bright, vibrant flavor." Dissolve sugar in water in a pot over medium heat, whisking while water heats up. As soon as sugar dissolves and water is clear, remove pan from heat. While water is still warm, add lemon zest. Allow to cool to room temperature before adding lemon juice. Whisk in lemon juice and lemon extract. Pour into a baking pan about 9x13 inches. Place in freezer until ice starts to form around the edges, about 40 to 45 minutes. Use a fork to stir up ice. Do this every 20 to 30 minutes until lemon ice reaches your preferred texture, 2 1/2 to 3 hours. For the sugar, 7/8 cup equals 14 tablespoons. Some people prefer their lemon ice on the slushy side. My preference is fully frozen, like shaved ice. This was so good! i made it more like a slushy with a straw in a glass. i think i ate an iceburgs worth! I made this with grapefruit juice instead and it was really good! I can't wait to make it again! Delicious taste. First I didn’t strain the zest out and it was a little to much; so next time I did and it was perfecto!! Delicious, skipped the lemon zest. Perfect for a hot summer day. Took forever to freeze, but worth it. Highly suggest!